The City of Glendale was named after a small train station between Webster Groves and Kirkwood on the Missouri Pacific Railroad. Glendale was a sparsely settled area of elegant country homes and estates around the time of the Civil War. The city was incorporated as a village in 1912, and became a fourth class city in 1916. 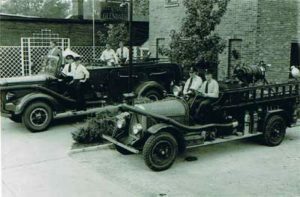 The Glendale Fire Department dates back to 1925 when a bond election was held on December 19 to build a firehouse and install a fire department. In January of 1926, a Cosmopolitan triple combination chemical hose and pumping engine (shown above), was purchased for $6,500. Twenty-two fire hydrants were also installed that year. When the firehouse was built, a fire pole was obtained from a St. Louis City Firehouse after that house was torn down. That pole is now part of a static display in the newly updated city hall. The Glendale Fire Department has come a long way since 1926. Those who first served our community in the early years laid the foundation of excellence and progressive innovation. 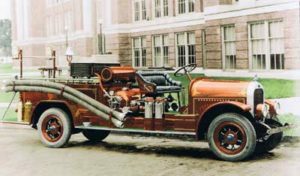 Our present day firefighters continue in this tradition of being innovative and progressive in many ways, most notably, by assisting in the development and instruction of the Rapid Intervention Training Program used by the University of Missouri Fire Rescue Training Institute. An SCBA Training Prop was designed and constructed by Glendale firefighters for this program. Members of our department also developed a “Rescue-Drag Tarp”; both are being used by fire departments throughout Missouri as well as other States. Over the past several years, Glendale has been successful in securing over $300,000 in funds through the Department of Homeland Security to purchase equipment such as SCBA’s, Turnout Gear, Radio’s, Computers, a Cascade System, Extrication Equipment, as well as the first Inflatable Fire Safety House in the State of Missouri, which has made a dramatic impact on fire safety education of our most precious gift, our children. In January of 2009 the department made the adjustment to the 48/96 work schedule and has employed paramedics on all three shifts, providing ALS pumper service to the citizens of Glendale and Warson Woods. July 2018 The City of Glendale Fire Department took delivery of its newest apparatus a 2018 KME Predator Pumper. 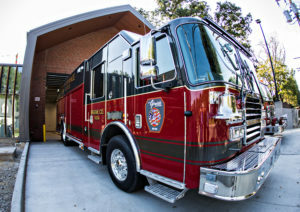 This unit was put into service in November as it was pushed in by the members to the new firehouse which was completed in July of 2018 as well.